The opening on January 10 of a new ‘apartheid road’, this one physically divided by a 8-meters high Wall symbolizes Israel’s aim to continue intensifying the stranglehold of its apartheid on our people. The road borders the so-called E1 area, east of Jerusalem. One side serves the settlers that travel from the illegal Geva Binyamin settlement to Jerusalem. The other side, for Palestinians blocks any access to Jerusalem. This 5 km long road is the first step to barring access for Palestinians to the main road going through E1 area, connecting the south of West Bank with the center, the north and the southern Jordan Valley. Once this historic road is closed to Palestinians, this will isolate all the 22 Bedouin communities in that area. These communities are slated for annihilation according to Israeli plans. As Khan al Ahmar and the other communities are bravely resisting forcible home destruction, Israel’s infrastructure is aimed to slowly tighten the strenglehold around them. Israel continued home demolitions already on January 2 in Qalandiya nighbourhood in Jerusalem. The house belonged to the al Mughrabi family and six family members lived there. On January 16, demolitions in the Jordan Valley continued with the destruction of yet another a facility in Fasayil, belonging to Abed al-Hadi Abyat. Israeli home demolitions have risen by 21 percent in 2018 as compared to the year before. 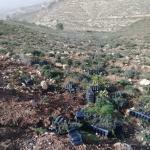 On January 13, settlers from the illegal Homish settlement invaded the lands of Burqa village, in Nablus district and destroys some 1000 tree saplings. The motivation behind this vandalism is to prevent Palestinians from using and eventually accessing their land so that Israel can annex it. At the same time, military forces are invading regularly Palestinian towns and villages, arresting the young generation. Ramallah has been targeted by night invasions for over two months. However, Palestinian youth are resisting and often confrontations continue until the morning hours.